The Internet was created to help create a new way to communicate and express ourselves, which are positive outcomes. However, over the years we’ve clearly lost some privacy and access along the way. 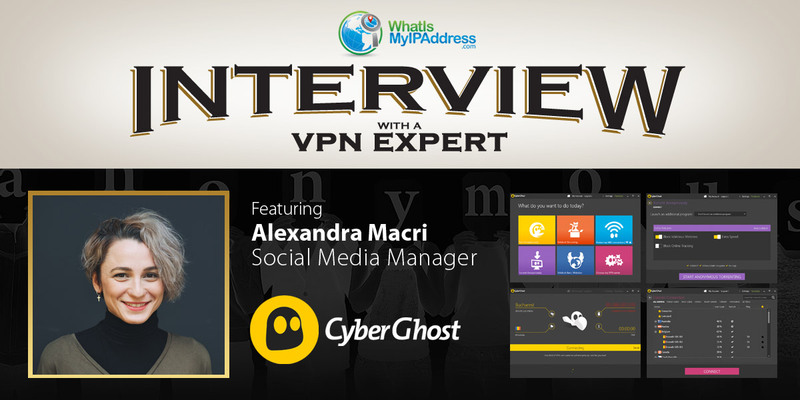 I talked to Alexandra Macri of CyberGhost VPN, who explains how you can get some privacy and freedom back. Reclaim your right to digital privacy with CyberGhost VPN. Based in Romania, CyberGhost defends privacy as a basic human right, being the first in the industry to publish a transparency report and developing technologies for the future. Chris: Can you explain why everybody should learn how to hide or manage their IP address with a VPN? ALEXANDRA: : It’s simple: bypassing censorship and regaining access to the entire web, not just to a part of it. If you want to be free while surfing online, you need use a VPN. These days, only a virtual private network can keep your identity safe and secure. If you use CyberGhost VPN, using our VPN as an example, it will mask your IP address with one of ours, so you will no longer be identified with your own IP address. You can choose from our servers and pick the country you want. It will, of course, change your location everywhere you browse. CHRIS: Could you give us some instances where people should be definitely using a VPN. ALEXANDRA: I’ll recommend the use of a VPN when using a free/public Wi-Fi. The VPN will automatically protect you every time you are using a new Wi-Fi or Internet connection. You will never be vulnerable, again, in a hotel, airport, restaurant, or any other new, public space. Also, a VPN can help you access blocked content. For example, the Russian government recently blocked the Telegram app, but you can bypass this blockage if you use a VPN. Keep in mind that our mission is to help protect your data, block indiscriminate surveillance and help those who need a safe channel to express their opinions freely. CHRIS: What makes CyberGhost VP a good choice for exploring VPNs? ALEXANDRA: We are the only VPN company to publish an annual transparency report. We believe in transparency as a fundamental condition for trust. Also, CyberGhost VPN is based in Romania, a country where the right to privacy is respected by the constitution. So, unlike many other countries, no authority requires us to keep data on our users. We are actively involved in activities and events that support the right to privacy and freedom of the internet. It's not just a business for us. It's a way of life, https://www.youtube.com/watch?v=BtMyr5RsxmU. All in all, we have nothing to hide (but we still use a VPN) and we love to take good care of our users' privacy! CHRIS: Are the others ways to use a VPN that people don’t know about? ALEXANDRA: Yes. With a VPN, you can save money - a less familiar use-case, but a very useful one. How come? Fares vary depending on the user's location. This can be easily checked if you activate a VPN and go to a ticketing website. Bear in mind that a VPN is not only great at changing your IP. It also helps you make safe online payments, even on public Wi-Fi, and makes sure no one tracks your digital behaviour by rendering you anonymous online. So, next time you buy an airline ticket, do it with a VPN. CHRIS: How does CyberGhost VPN take steps to ensure the privacy and/or anonymity of its customers? ALEXANDRA: First of all, CyberGhost keeps no logs. CyberGhost VPN is 100% dedicated to the no logs policy, but it may not be clear for everyone what exactly it means. Also, we have our own data center with dedicated servers to make sure that it is safe from the physical access of NSA or hackers. We use quite a few providers and we always ensure our rented servers are thoroughly vetted before proceeding with a contract. In fact, all providers we work with need to match our high standards regarding privacy and security and the servers are exclusively configured and used by CyberGhost. Since the beginning of CyberGhost VPN, our focus has been on providing our users the strongest encryption. And we are very happy to say that their privacy is safe with us, because we have no DNS leaks. CHRIS: With all the advantages VPNs seem to offer, what reasons do people have for not having one? ALEXANDRA: The most-heard sentence is, “I have nothing to hide. That’s why I don’t need a VPN.” These days, we often hear this sentence, either from our friends, users, parents, etc. They may not have anything to hide, but please be aware of what is happening worldwide with our data. Also, we have to keep in mind that our data might be used against us - see the recent scandal with Cambridge Analytica (they used internet users' data to manipulate their political view). Secondly, maybe, they think that the price is too much for a service that is doing an invisible job (protecting our data by creating an encrypted tunnel and changing your IP). Here at CyberGhost, we think that our users are investing into their freedom. And when we look at countries like China, we deeply appreciate our privacy and anonymity. The Internet was created to provide people around the world freedom of expression, opportunities and education. Meanwhile, the times have changed, nowadays, we need to pay if we want to surf freely the Internet. Finally, they think it’s too complicated to use. At CyberGhost VPN, we work hard to make our service user friendly and as automated as possible. A reliable VPN app is super easy to use. Most people get surprised by how simple it is when they first use it. VPNs are not just for techies – they're for everyone! That's because we believe that privacy should be easily accessible for every Internet user out there. CHRIS: Do VPNs stop advertisers tracking us by our individual IP address activity? ALEXANDRA: The one of the biggest misconception regarding VPNs—that a VPN will protect you from ad tracking by default. A VPN can hide your IP and make you invisible to your ISP, but they all don’t automatically block the ad trackers. Only some VPNs have this extra feature. Our Premium subscription, called CyberGhost VPN, can protect you from ad tracking and make you truly anonymous online.